Brianna Mitchell (3L) delivered the final Student Scholars Series lecture of the semester on March 29. 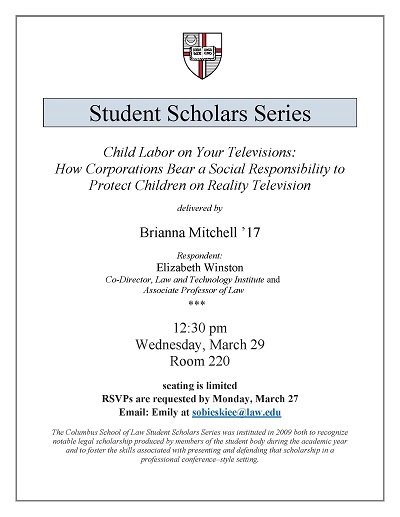 Mitchell's scholarship, “Child Labor on Your Televisions: How Corporations Bear a Social Responsibility to Protect Children on Reality Television,” argued that media corporations have a social responsibility to ensure that the children who work for them are paid a reasonable wage and are informed about the potential pitfalls that come from being famous. Mitchell, Brianna, "Child Labor on Your Televisions" (2017). Student Scholar Series. 25.